Anyway, this is post is about things that move quickly and things that move slowly. Last post I promised photos of the 4 scarves I’d woven at the end of June. First up is a scarf in which I successfully used ladder ribbon as a supplemental warp. I’d tried using ladder ribbon before and hated it. I’d also tried some supplemental warps before, not successfully. I had to try again, with both, after a recent Guild meeting when a fellow weaver showed some yardage she’d made. I asked lots of questions, and she told me the draft was in a Handwoven magazine (November/December 2000). I got my hands on this issue, copied the appropriate pages, and then made a bunch of changes to the draft. I only warped my loom for 1 scarf, since I wasn’t at all sure I’d like it. I used 10/2 cotton, sett at 24 EPI. Winding, beaming, and weaving all went rather quickly. I’m not overly fond of the colors, but will use a similar draft in the future, both with more of the ladder ribbon and some other ribbons I have. Then I warped my loom with my last batch of handpainted yarn, this one being the blue-green tencel. 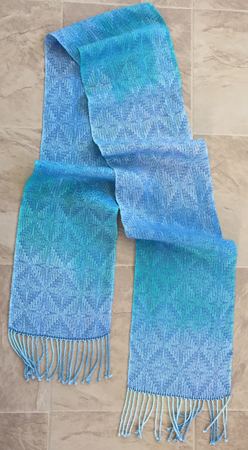 I threaded the loom for Tara Oftenorth’s snakeskin variant, and wove the first scarf with a medium blue weft. I love it. Just because I could, I added some sweet little beads to the fringe. 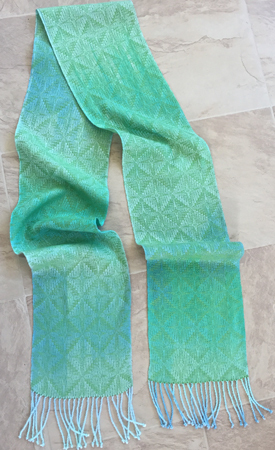 Next up I used an odd, bright green rayon weft I’ve had forever. This yarn is definitely not my favorite color, which is why I’ve had it forever. But it worked perfectly with this warp. I had enough warp left for a short cowl. 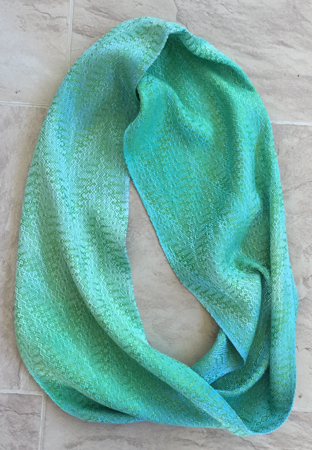 After auditioning several different colors of weft, I returned to the odd green since it worked so well. I modified the treadling to be a simple zigzag pattern. After picking and making some more cherry stuff, I went back to the loom. I decided to use just one motif at a time for my transparency, not drafting out a cartoon for its entire length. This will both save time and hopefully make the actual weaving a bit less cumbersome. It’ll also be a bit less planned, and hopefully that will work well. My sister was interested in how I wove the transparency. When I explained it to her, and that I needed several ‘bundles’ of yarn of each color, she was a bit amazed. 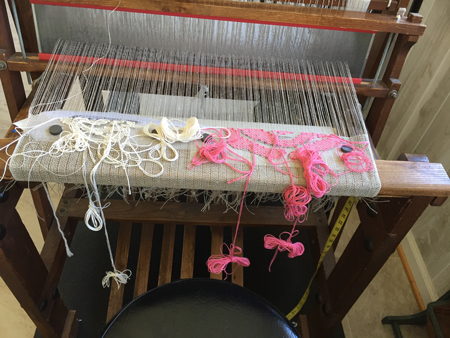 I thought I’d take a photo of weaving in process so everyone could see it in all its messy glory. S.L.O.W. 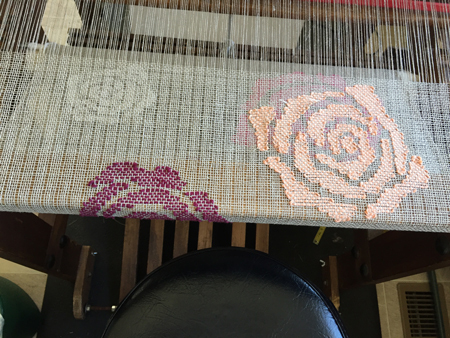 Since there are lots of ends to weave in, I decided that given my temperament I was better off to do that for each rose as I finished it, not waiting till it was all off the loom and I’d have about a gazillion ends staring at me. Again, S.L.O.W. 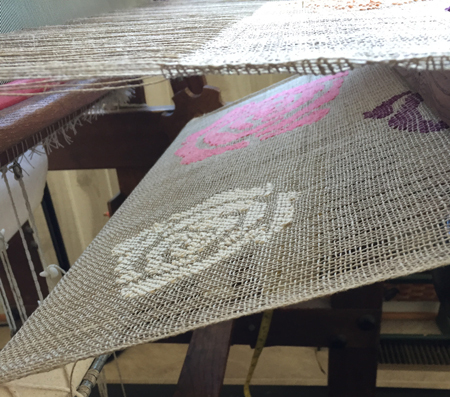 You’re seeing the wrong side of the weaving there. That’s the side I work from. So here’s an in-process snap of the right side. 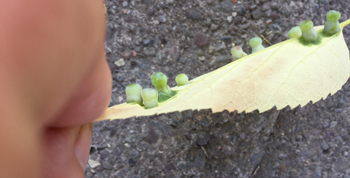 Completely unrelated to weaving, on my walk the other morning I came across these infested leaves on the sidewalk. I have no idea what kind of creature was living in these ‘bumps’ nor was I going to bring one home and watch it. So your input on the nature of this phenomenon will be appreciated. Gotta get back to work. I still have to warp my rigid heddle loom for demos this weekend. I’m planning to use a variegated thick-ish sock yarn. Hope it works well. I’ll wind a tiny sample on my little jig for a test of sorts. Beautiful transparency Peg! Boy, slow or not you really took to it I think. Love the funky green makes myself, but then again, green is a favorite color. I think when I learnt ballroom dancing, more years ago than I care to remember, it was the slow foxtrot that went ‘slow, slow, quick, quick, slow’ Amazing what’s lurking in the back of my mind. I’m in awe, my friend. Yuck – what are those green-onion droppings living on the leaves? It’s a cinch I don’t want to know/touch/watch any of them! 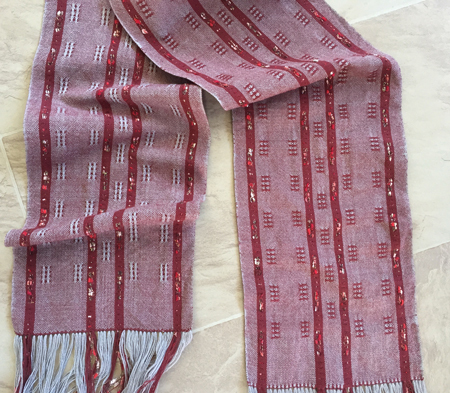 I LOVE the first scarf – with the ladder ribbons. It is beyond eye-catching! I’m sorry to hear that the green is not your favorite color – I think I have to vote in its favor. Now – to the roses – you explained it, you drew it, but I’m still in the land of amazement at what you have to go through to create these. They are really something else!! Keep up the great work, Peg! Theresa – As long as I’m not feeling pressure to produce for shows, I’m okay with moving as slowly as transparencies require. At least for now. Wouldn’t want to make a steady diet of it. And although green is not my color (makes my skin look, um, sick), I like to use it when I can for my customers. And I am fond of these scarves. Helen – I never took ballroom dancing, so would trust anyone who did for the correct info. Join the other (just not me) green lovers. Jennifer – You’re always so complimentary it embarrasses me. Alma – Why do you think I didn’t bring that leaf home? There were LOTS of leaves with those things on them right in that area. You, too, can join the other green lovers. Thanks for the comments on the transparency. We’ll all have to wait to see what it looks like when it’s all done. Don’t hang by your toes for this one. MAYBE I can finish the weaving by the end of next week? MAYBE? ?